It will be impossible to leave the Thomaston Opera House after enjoying The Buddy Holly Story and not want to play Buddy Holly’s greatest hits on your drive home. 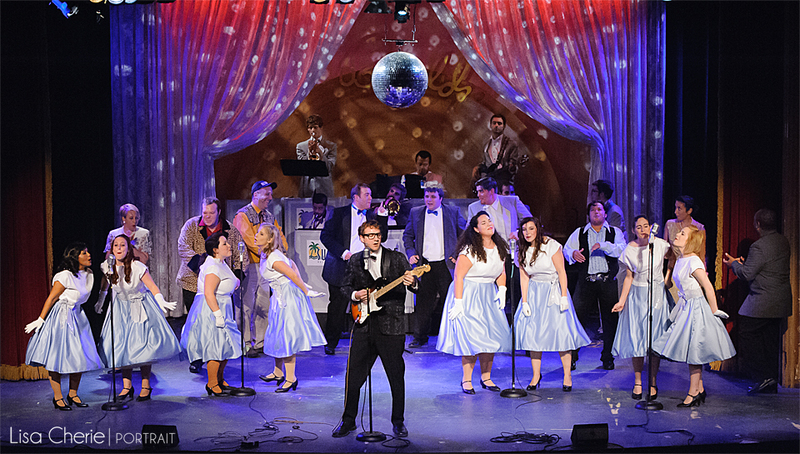 Showcasing 20 of his beloved songs including Peggy Sue, That’ll Be the Day, Oh Boy and more, the music takes center stage in this Landmark Community Theatre production. Rob Girardin rises to the occasion in the title role, personifying the stalwart, at times obstinate, musical genius whose clarity of purpose and vision was the driving force behind the legend. The show creates set pieces around the songs; they are performed most often during concert scenes or during recording scenes. The trio of Girardin as Buddy Holly (voice/guitar) and the Crickets- Frank Beaudry as Jerry (drums) and Dan Porri as Joe (bass) are the three key players. There’s no lip synching, it’s not dubbed. They play the instruments and sing the songs. When you watch this production of “The Buddy Holly Story”, you’re seeing Buddy Holly and the Crickets in concert. They are often joined by the 4th Cricket, guitarist Tommy (Noel Roberge) and in one very important performance there’s a full band ensemble including horn section under the direction of Musical director AJ Bunel. There’s more music than just Buddy Holly’s tunes; Carletha Hawley’s vocals soar through the Opera House as she performs two songs “at the Apollo”. Chris Kulmann as the Big Bopper channels Chantilly Lace and Theo Savilla’s Richie Valens rocks the house with La Bamba. A singing trio (Breanna Riollano, Lynn D’Ambrosi, Katie Roberge) bring a country song, a jingle and a 50’s doo-wop song to life. The different styles of music within the show create a nice balance for the audience to appreciate the time in which Buddy Holly and the Crickets made their mark. KC Ross as Vi Petty brings some humor to the show as the suffering wife of the record producer. When he’s not drumming, Frank Beaudry’s comedic flair creates memorable crowd pleasing laughter with interactions with Girardin’s Holly and later with Caitlin Barra as Shirley in a particularly funny exchange. Mike Schick gets uncomfortable back stage at the Apollo. Both announcers, Dan Beaudoin as the MC at Clear Lake and Foster Reese at the Apollo get the crowd amped up for the acts they are about to see. Reese imbues his scenes with energy, style and humor and he’s got some moves! I wanted to make a special mention of the costume design. Barbara Piscopo outdoes herself here. Since many of the scenes take place “on the stage” the audience is still allowed to be immersed in the time and place of the scene/action specifically through the costuming. Whether there’s a country hoe-down or a 50’s rock and roll extravaganza, the costumes are dead-on and deserve an extended mention all on their own. There is no secret as to how Buddy Holly’s story ends, but there are two key ingredients to understanding this show. The first is knowing that before that end, Buddy Holly never undergoes any change of heart; his story arc is not a personal exploration to enlightenment because Buddy Holly was ahead of his time; he held a clear vision and it is the rest of the world that has to catch up to him. The way he pursues his beloved Maria (played by Sarah Rubelmann) is the way he pursues his music, with a purpose and clarity that shocks those around him. From his former manager and local DJ Hipockets Duncan (played with humor by Chuck Stango) to the DECCA (a country label) producer (played by Peter Bard who takes on three roles in the show) to the hard-nosed businessman and record producer Norman Petty (Mike Ritts), all three try to mold Buddy in their own way but Buddy will not mold his music to any standard other than his own. The second key ingredient to the show is the audience. Remember, when you go, you’re not just at the theater, at times you are at a real rock and roll concert so you are WELCOME to dance! Under other conditions a Connecticut theatergoer would never dare dream of standing up during a live theatrical performance, but I assure you, if you stand up to dance, the person behind you will join you. It’s welcome and encouraged and fun. Get into the aisle like you would at any rock and roll concert. During the larger concert in Clear Lake when the whole ensemble including Ashley Almodovar, Leanna Scaglione, Lynn D’Ambrosi and Nicole Thomas make their mark, you will get the full-on Buddy Holly experience. When they’re dancing, they’re encouraging you to dance too. When Foster Reese makes some moves at the Apollo, make some noise-it’s part of the show. YOU can be part of the experience. If you feel your foot tapping, roll with it. The larger the audience, the better this show will be. The Buddy Holly Story showing September 20, 26, 27, October 3 & 4 @ 8pm and September 21, 28, October 5 @ 2pm. Did you see Buddy Holly or are you GOING to see Buddy? If so, put a comment here! And be sure to share! I had the privilege of seeing ” Buddy Holly” this afternoon. It was so enjoyable! Every cast member gives 100%. The band is fantastic! You’ll find yourself singing & clapping along with the exhilarating music! Don’t miss it!